This is my most favorite drink. Ever. There is nothing I love more than a warm, breezy afternoon and a pitcher of Brazilian lemonade. This recipe (and pictures because they did such a great job!!) is from one of my very favorite blogs http://www.ourbestbites.com. I had some Brazilian Lemonade at Tucano’s and my life has not been the same since. I’ve never met anyone who doesn’t love it, but I won’t tell them what’s in it until they try it because about 80% of people seem to have the same reaction as I did. And yeah, I totally just made up that statistic. It starts off with fresh, juicy limes. You pop them in a blender with some sugar water and pulse a few times. I like to pulse mine more than the average person. Using the whole lime takes advantage of the flavors from both the juice and the flavorful oils in the rind. 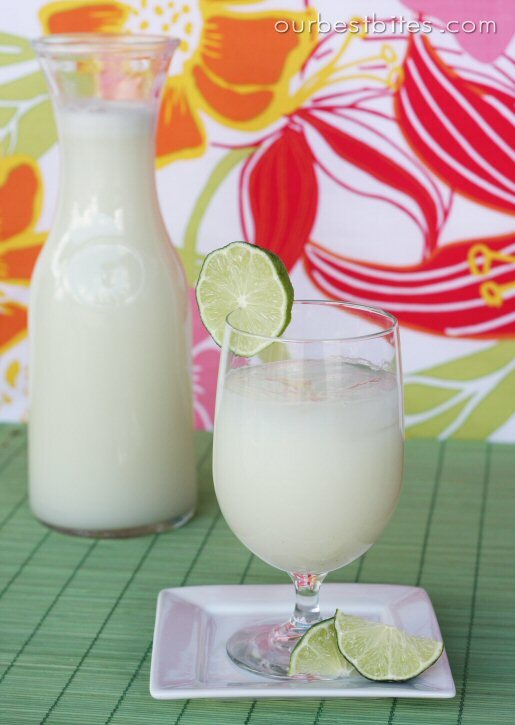 Pour the mixture from the blender through a strainer and into a pitcher, thus saving all of the flavorful liquid. You might need to do this in a couple of batches. Then the secret ingredient: sweetened condensed milk. You can buy these mini cans in the latin section of the grocery store or just open a regular sized cans if you are making a bigger batch. Mix cold water and sugar very well and chill until ready to use. This step can be done ahead of time. 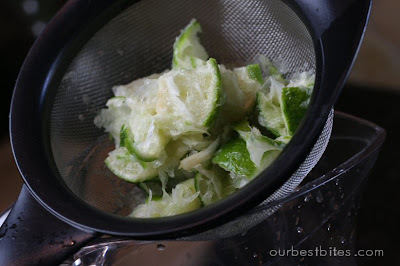 Wash limes thoroughly with soap (I use Environne Produce Wash, you can buy it at Trader Joes or Maceys grocery store or if you can't get your hands on any just use hand-dishwashing soap or regular hand soap); you need the soap to get the wax and pesticides off of the limes because you’re using the WHOLE lime, baby. 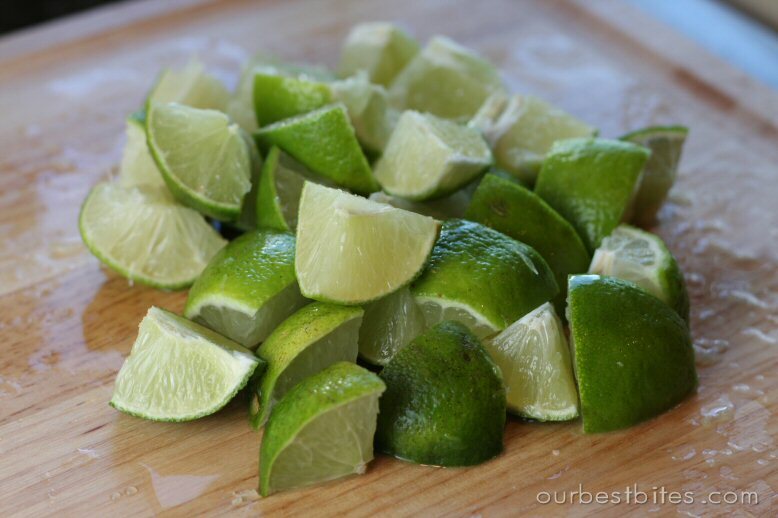 Cut the ends off the limes and then cut each lime into 8ths. 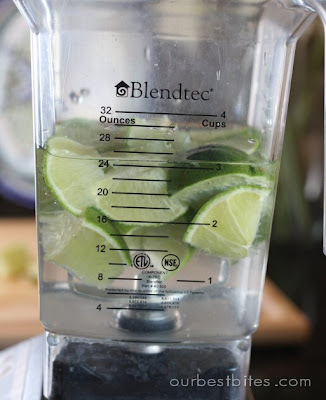 Place 1/2 of the limes in your blender. Add 1/2 of the sugar water, place the lid on your blender, and pulse 10 times. Place a fine-mesh strainer over a pitcher (the one you’ll serve the lemonade in) and pour the blended mixture through the strainer and into the pitcher. 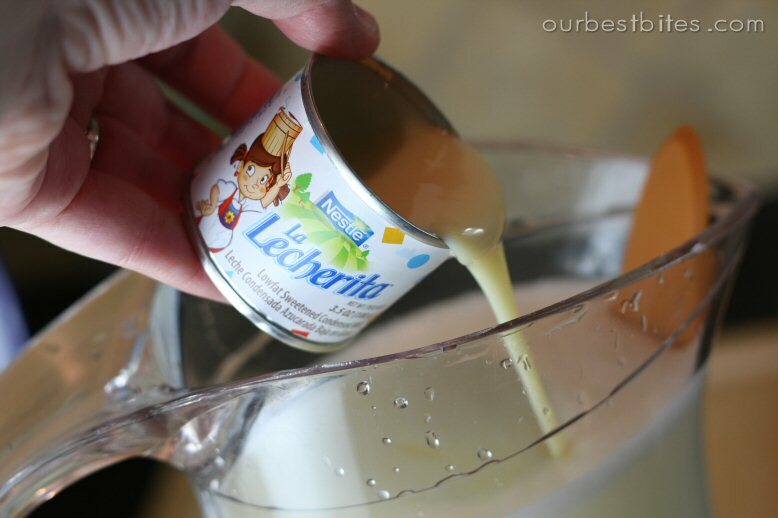 Use a spoon to press the rest of the liquid into the pitcher. Dump the pulp and stuff in the strainer into the trash. Repeat with remaining limes and sugar water. Add sweetened condensed milk; DO NOT leave this step out unless you will die of a horrible sweetened condensed milk allergy because this is the secret ingredient! You may want to taste test it at this point; I used giant, thick-skinned limes tonight and didn’t test it and it came out a little bitter. If it’s bitter, just add some more sugar and maybe a little more milk. Serve immediately over lots of ice. This does not keep well, so don’t make this in advance (although you can cut the limes, mix the sugar water, and measure the sweetened condensed milk in advance). Serves 4, although I can pretty much guarantee you that people will want more; I usually plan on 1 1/2 servings at LEAST per person. That looks GOOD!!!! I think my dad and my hubby need to trade their Diet Coke addiction to this!! Truthfully, it is sooo good. I cannot stress this enough!